The pizzelle is the traditional Italian cookie. The baker makes four 3-1/4” pizzelles at a time, has extra thick non-stick baking plates for even heat distribution, and a steam guard to protect hands. 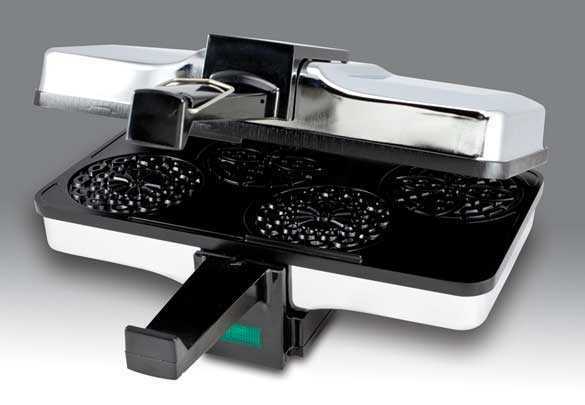 The stainless 750 watt baker measures 10”w x 4”h x 6”d. You can use your own Bräzeli recipe with this iron! The size is about the same, it only makes a thicker cookie. It's a great alternative for a great price! You can make anybody happy from a 2-100 year old with this cookie!! ENJOY! Service Area: New Glarus, Beloit, Janesville, Freeport, Rockford, Whitewater, Roscoe, Monroe, Platteville, Waunakee, De Forest and surrounding communities.